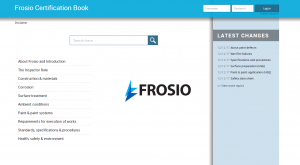 Our FROSIO inspectors book (App) has now been opened and can be downloaded from App or play store. This is the first issue and e will revise it when necessary and. The Book/App is free but requires registration. When downloaded you will be asked for your e-mail and to set a password. You will then get an e-mail for verification and registration. You can then log inn on your phone, tablet or PC as you wish. Good luck. The book can also be found on the web: www.frosiobook.no . Later a pdf version will be available for print from our web page.